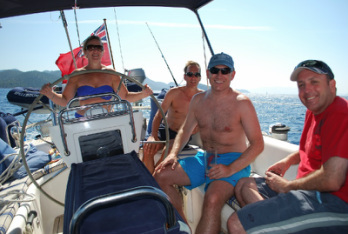 Previous 'Afloaters': Julie Lord, Bryan Knight, Iain Wishart and Ian Robinson! Although luxurious in every way, “Spellbound” has limited accommodation so places are strictly limited. In order to be part of the elite minority of Financial Planners who take part in these inspiring events - please register your interest as soon as possible. Please Note – Previous sailing experience is NOT required – but you may learn a thing or two! There will be no expectations placed up on you and you are free to participate as much, or as little as you wish. You can stretch yourself, challenge your comfort zones, or just lay back and soak up the sun. It’s up to you!